Young attorney, Jill Clark, finds herself held hostage in her hotel room by a deranged man who appears guilty of killing three people in a post office bombing and injuring one fiver year old boy. After promising to represent him in court if he lets her go free, she feels a strange pull to him and his story of innocence in the bombing even though everyone is telling her she’d be crazy to represent him after her harrowing experience. The person who is most concerned with her safety is fire man, Dan Nichols, with whom Jill had an unsuccessful relationship previously. Can Jill learn to trust Dan, who claims he has been reformed through Christ, and God to keep her safer from several life threatening encounters? Is representing Jerry in court going to lead her into a closer, more intimate, relationship with God too? This novel is full of fast-paced action, suspense , mystery and is interwoven with a strong thread of romantic love. The underlying theme of covenant between men and between God and mankind makes this a wonderful contemporary novel with a strong Christian witness. This is another fine novel in the new “reality rescue genre” including other great novelists such as Dee Henderson. 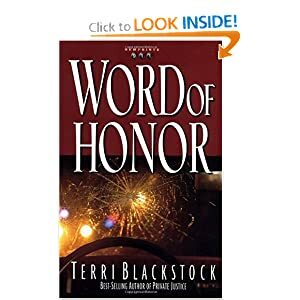 The story line in Word of Honor is strong; the characters are strong and realistically portrayed; the plot is quickly paced and exciting. The one weakness I found was that the love story was a little too weak to begin with. I found it a little unbelievable that Dan “suddenly” realizes his love for Jill when he finds her life in danger. The way the characters deal with their emotions for each other was much more realistic as the story developed. For example, Dan getting angry and going out with an old girlfriend reeks of typical guy behaviour (grin). Over all, this was a well-crafted novel of suspense, faith, redemption, justice, and romance. I look forward to reading the others in the series when I get a chance!